Check out this guy’s tent, eh? We called it the Taj-ma-tent while we were camping. It was incredible…the last day of our trip we talked to him and got to go in and see the inside. 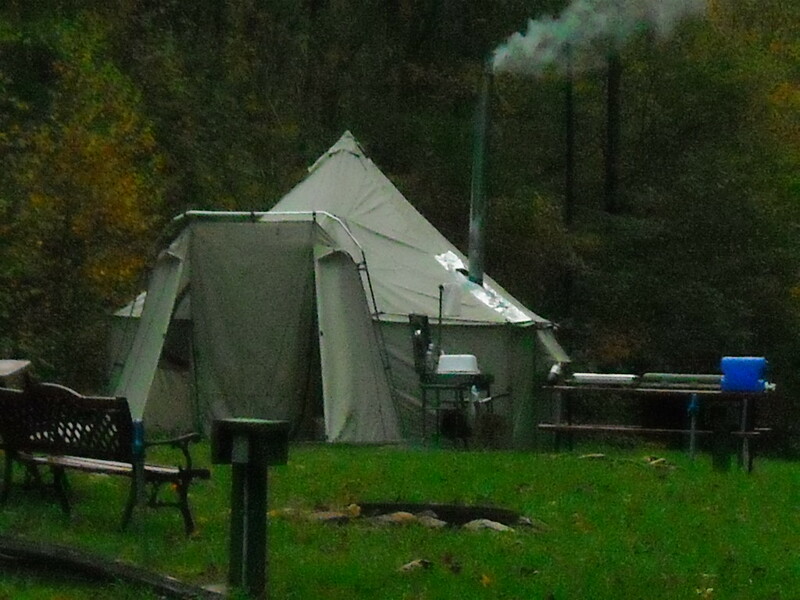 He had a wood stove and the tent was very balmy and wonderful. The tent’s resident is a photographer named Mike Florey. He told us that he was going to be at Moonshine Creek through the end of October and was going to go home and then head out to the Ozarks. Mike is a photographer…an incredible photographer. I wish he had a website so I could refer you to it to see his stuff, but he had too much trouble with people stealing his work. So, suffice it to say, if you’re out looking for beautiful art to put on your walls, check and see if Mike Florey is the photographer and buy it if so! Mike travels over the country and pretty much lives in that tent. He’s weathered 50 knot winds in it and total whiteout conditions. Sounds crazy? Maybe, but what really struck me upon listening to him is the realization that he is really living his dreams. His dreams have him living mostly in a tent in freezing weather, but he loves it, and he wasn’t afraid to pursue it. Incredible, eh? He was also just an all-around really nice guy, which made me even happier about his being so happy in his life. Today was pretty rough…I don’t know…it seems like I say that a lot, so I should probably just stop;). I’m getting there, though. Things are coming together in my mind and forming into these awesome ideas and, for once, I really do believe that I can achieve what I’ve set out to achieve! I have a lot of these feelings that I owe to Angela and Heather. Both of them made some pretty big life changes that have been very positive and, because they’ve shared their respective journeys, people like me can read and learn. It also helps that they’re my age…that way I can see that it’s still possible:).